Despite the thousands of alumni carrying the name of our proud alma mater, it really is a small world. I say this after meeting Dr. Heidi Cohen (C’83, PAR’13, B.A. 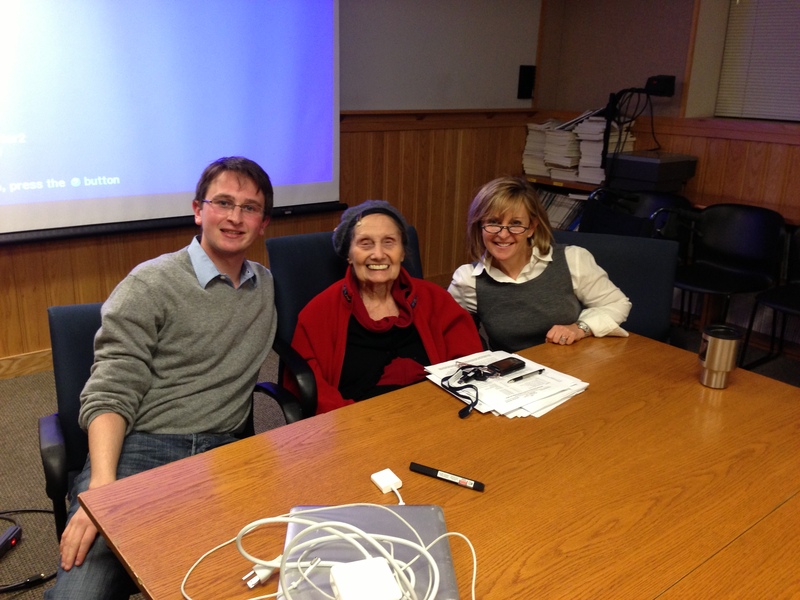 Biology with a concentration in microbiology), who returned to Penn recently to visit her son, Harrison Lieberfarb (C’13). But Dr. Cohen, a pre-med graduate of the college in 1983 and now a successful Assistant Medical Director of pediatric emergency medicine at Joe DiMaggio Children’s Hospital in Hollywood, FL, came not only for a family visit. She attended her son’s class (led by Dr. Helen Davies, Professor of Microbiology), to give a lecture on malaria. What makes the world so intimate is that Dr. Cohen took this same class as an undergraduate student in the 80’s with the same professor. Furthermore, the course influenced a large amount of Dr. Cohen’s professional experiences both in medical school and afterwards. Below, you will see what I mean after reading our interview. Pictured from left to right: Harrison Lieberfarb, C’13, Dr. Helen Davies, Professor of Microbiology at University of Pennsylvania, and Dr. Heidi Cohen, C’83, PAR ’13. How did you join Helen Davies’ class? A friend recommended that I take this class, which is a Benjamin Franklin Seminar. I had to get permission from Dr. Davies to join it because it was reserved for juniors and seniors. Our main project was a presentation on an infectious disease. My infectious disease for study was HIV. We had no access to computers like students to today, so I had to go the library and just research everything about HIV; everything about its symptoms. As an undergrad, I learned quickly how to synthesize this information and organize it. This influenced my later work greatly. The way I presented the material also had a huge affect on my work methods today. Because we had no Powerpoint, I just had to get up in front of a class and talk. Now I teach and lecture in universities and at conferences. What was it like to move from the instruction of a classroom to real-life practice of medicine? Working in the ER puts you first in line to witness some historical outbreaks, like HIV. Even when working in emergency rooms after graduating, I saw this—it was the disease—all the time. Back then in the 80’s, there were no antivirals, no medicines, and nobody really knew what kind of disease it was—HIV was a death sentence. It was depressing. Today, I couldn’t even tell you where the HIV positive children in the ER are. It’s been fascinating to move from seeing it in tons of children all the time, to never seeing it again. In my residency, our emphasis was not on reading. We were told we would learn about medicine by seeing it. I own it now because I did it. I chose a program where I had to make decisions quickly. I’m good with observing, making diagnoses, and dealing with anxious parents. At work I have five minutes to observe a patient, establish trust with them, order whatever they need, and convince them that the treatment is appropriate or alleviating. When you know your style, you learn about how you learn, and that can be very beneficial when you have to think on your feet. What kinds of activities at Penn helped you prepared for your career? I started research at the medical school as a sophomore. I knocked from door to door of various professors to see if any were hiring, even though I had only taken Intro to Biology at this point. Dr. Akira Kaji eventually hired me. In his lab I learned how to pipette, sterile plates, and map E.Coli. The work was published in well-known magazines like Science and Nature. I spent three years and every summer doing this work, along with working at CHOP. I also volunteered with high risk OBGYN organization. While other students were out there partying, I was helping deliver babies. Other times, I would work with rehabilitation patients, and we would do great things with them. We would walk the patients, in their wheelchairs, to Hutchinson’s gym, change them into bathing suits, and swim for therapy. It was a great experience. Outside of Penn, such as at a public health clinic in Long Island, I was a translator. They needed someone to translate between Spanish and English. I offered to do this work if they let me cycle through their clinic. Altogether, when I started medical school I was in great shape, because I had all of this experience and exposure. What kinds of cases do you see in the emergency room today? The most frequent cases I see are common conditions—things like asthma and trauma, mostly from tourists. Most people come into the ER because they overreact to things that can be addressed by a visit to a general practitioner. I’d say about 80 percent of the cases I see should go to a regular office. Still, you never know what will walk in the door. I’ve seen some of the most unusual cases, like Addison’s disease. I once had a mother bring her young daughter in. She was scrawny, pale, and obviously very sick. The mother was mostly worried about a rash, but I noticed right away her gigantic lymph nodes. It took 20 minutes for us to confirm some suspicions. She had lymphoma. Has being a female practitioner affected your career or work place? I find it harder for women because we have to balance our families and children with our work. I had three children to take care of w. Working in the ER is exhausting, and you really learn to cope with the stress both from that environment and that constant balancing. But I never tolerated that I was weaker or inferior because I was a woman. That attitude, along with raising my children, really gave me better training as a pediatrician. How does this job affect your family life? As I said earlier, some things never leave you. My children, for example, do not go to carnivals since I dealt with an outbreak of an STD at one in New York. But my children have a unique perspective on what’s important. I try to remember that what’s important for me can be very different from them. They might be preoccupied with getting an A on their papers, or making it to practice on time, while I am dealing with all kinds of emergencies during work. But overall, they’ve heard a lot of different stories from me, so they know how to prioritize things. My daughter, though, was Pre-Med at Georgetown for about 15 minutes. When asked why, she replied, “I will never leave the library.” And it’s true; if I could relive my experience at Penn, I would still study medicine, but I would spend less time in the library, and more time having fun. You certainly see a lot of fascinating but disturbing things in your work. How do you handle emotional distress? If I don’t get upset, then I know I have a problem; you should feel that way in this job, or you shouldn’t be working. I have to do my job, but I have to remember the emotional side when telling someone about their injuries and sickness, or telling a mother that her child just died. Would you want a doctor who wasn’t empathetic? Any special messages for the classmates from 1983? I am very excited to return for reunion to see what my old friends have done in the last 30 years since we graduated! As medicine has evolved so have we as providers, wives, husbands and parents. As my son Harrison will be graduating it will be like reliving my own graduation experience. I think his participation in Mask and Wig has brought my family closer to Penn as we have gotten to know the company, hosted them in our home for two tours and have seen countless productions. Coming back for reunion will bring me full circle and enhance my memories of Penn both from the class of 1983 and from Harrison’s class of 2013.